Product Features Brand new, non-refurbished, non-OEM, Rechargeable Lithium-Ion Acer Travelmate 290 Series Battery Pack with one year warranty,30-day money-back. Li-ion acer travelmate 290 series laptop batteries, a new life for your acer computer. 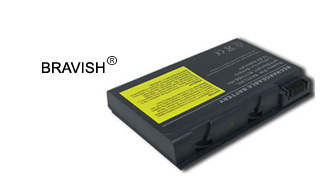 This acer travelmate 290 series notebook battery is a 4400mAh 14.8V Li-ion notebook replacement battery. Compatible Part number : ACER BATCL50L Battery. Volts: The voltage of the new acer travelmate 290 series laptop battery should always match the voltage of the original. mAh:It standards for milli-Amp hours,the high amp-hour rating means longer run-time and can not cause incompatibilities. Breaking In New Acer Travelmate 290 Series Battery - New acer laptop battery come in a discharged condition and must be fully charged before use it. It is recommended that you fully charge and discharge your new acer laptop batteries two to four times to allow it to reach its maximum rated capacity. Charge Your Acer TRAVELMATE 290 SERIES Batteries Properly - Fully charging and then fully discharging it at least once every two to three weeks.With lithium-ion acer laptop batteries, partial charges and discharges are best on a regular basis. These batteries do not suffer from the memory effect. Store Your Acer TRAVELMATE 290 SERIES Notebook Battery Correctly - Storing it in a clean, dry, cool place,Don't store notebook batteries completely discharged. A 50% charge is optimum for storage.